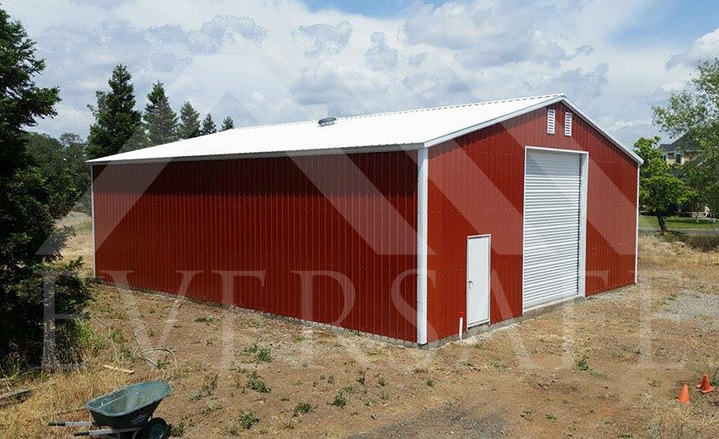 In February of 2017 a 24×25 a shop steel garage building kit was ordered from Eversafe by a customer in Columbia, SC. 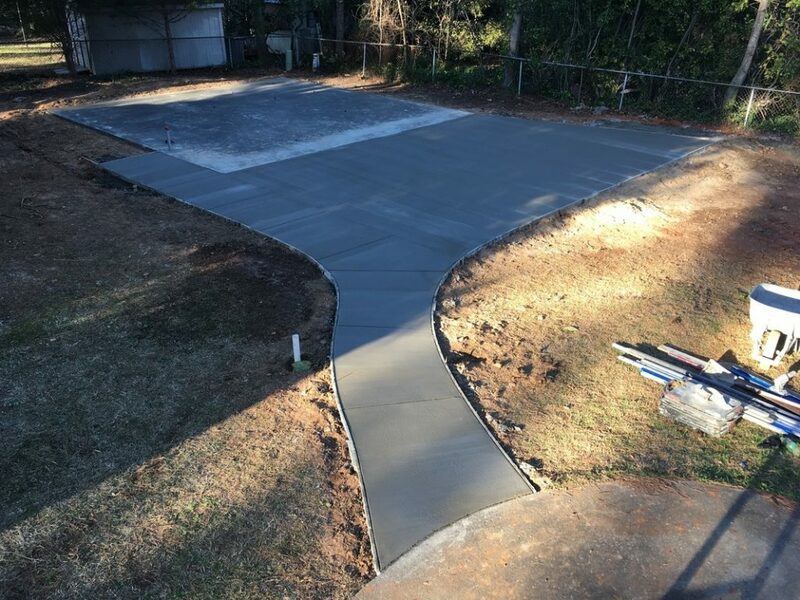 The following descriptions and photos illustrate the concrete work done including pouring a concrete slab with an apron and walkway to the house. 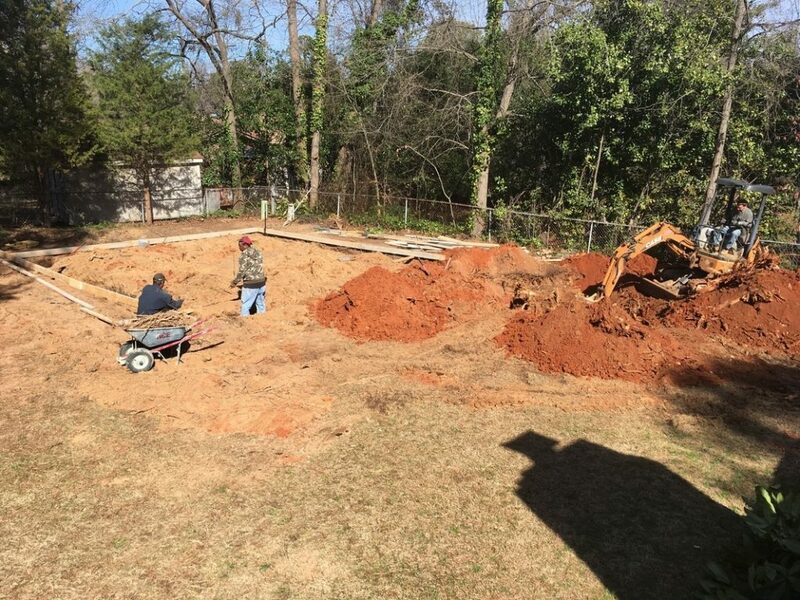 The first task was to dig the foundation and prepare the ground for a slab, apron and walkway. 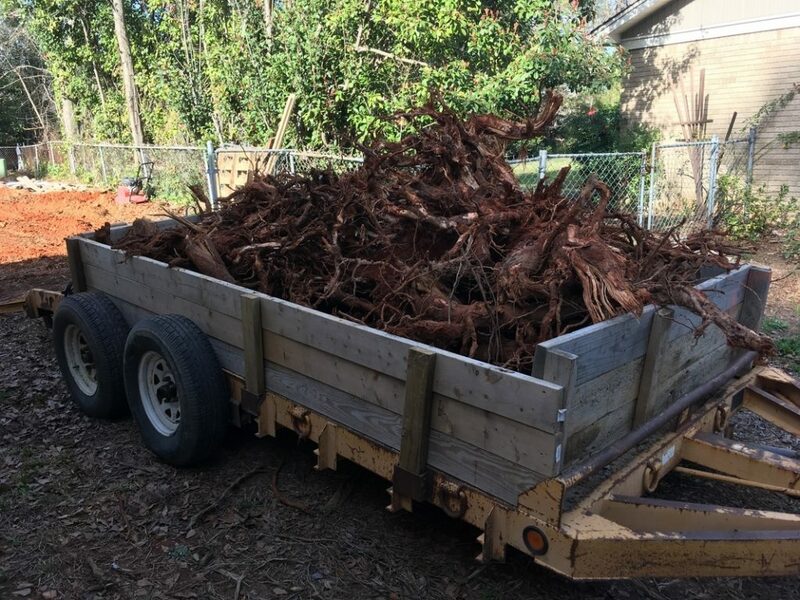 The stump removal wound up being a bigger job than anticipated and instead of doing it the hard way, they brought in some equipment to extract the root system. Whenever large stumps are removed the root debris should be removed, the hole filled and compacted to avoid cracking. 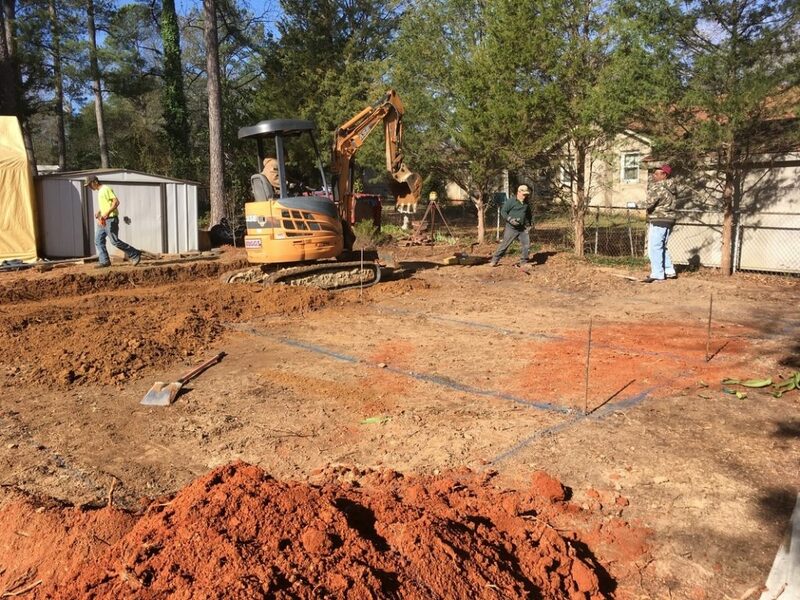 Before you ever dig, contact your building department to check on permit requirements and call 811 to have the local utility companies come out and mark the wires and pipes that are buried. Part of the floor needed to be reinforced for an auto lift to be installed on top and was marked off in blue. 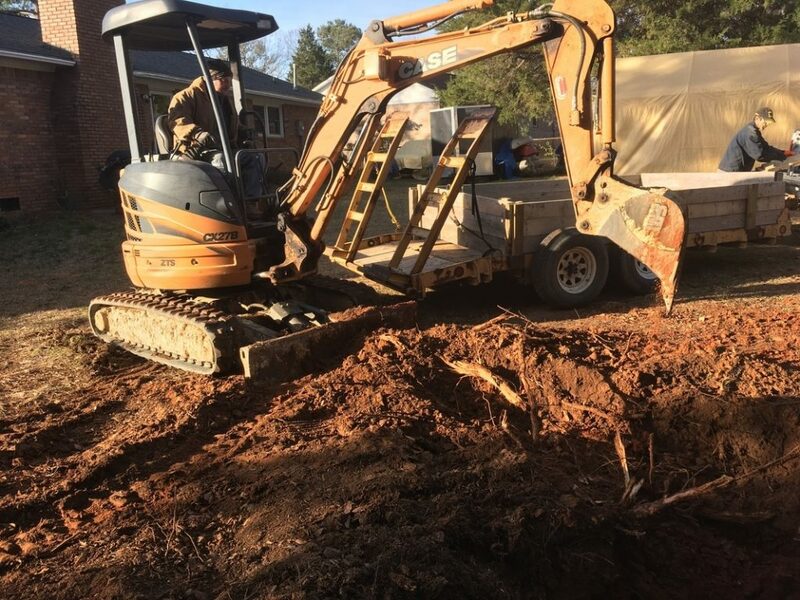 The footer excavation went quickly and the form lumber starting going in while excavation of the stump continued. 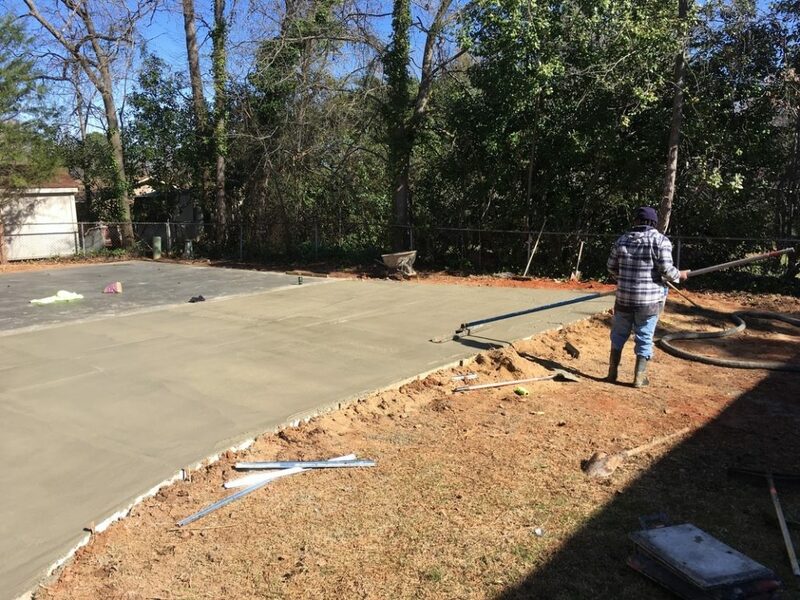 When choosing the boards for each side of the slab the most common size is 2×12 (for South Carolina or Southern state climate conditions) and make sure they are straight. If you don’t have boards long enough to span the entire side of the slab nail a 4’ section of 2×12 to cleat over the joint. They decided to go with mostly earth formed design for the footing using minimal lumber. Some areas do not allow this; please check with your local building department for guidance on footer requirements. 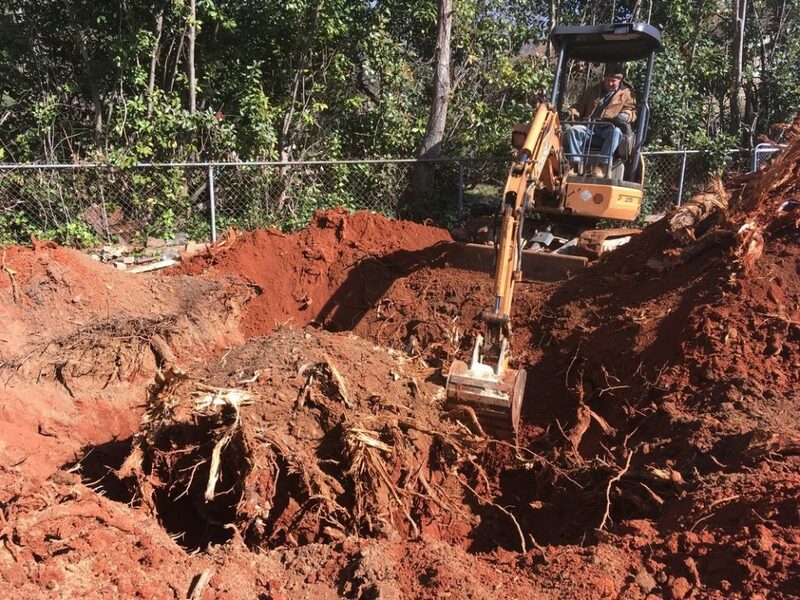 The stump and root system removal took quite a bit of digging! The little excavator and trailer made the job go quickly, don’t try this with a shovel and pick axe! The site is naturally close to flat and level which made the project a bit easier as the only fill needed was to fix this hole. 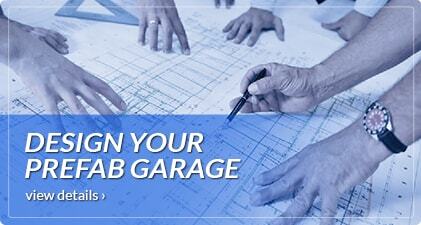 If you have a sloped site or have to bring in a lot of fill the project will be a bit more difficult. 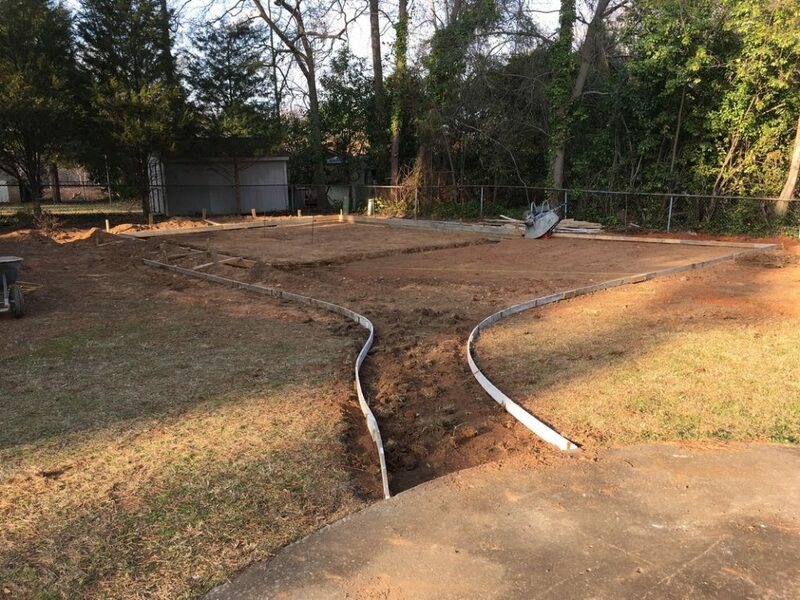 Creating a firm base is imperative to help prevent cracking and unless you have soil that is sandy a layer of gravel or crushed stone should be laid to help drainage under the slab. 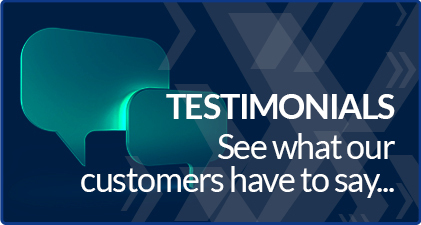 Make sure to ask your local concrete supplier what they recommend should be put down under the concrete. A firm base that drains well is crucial to eliminating cracks. 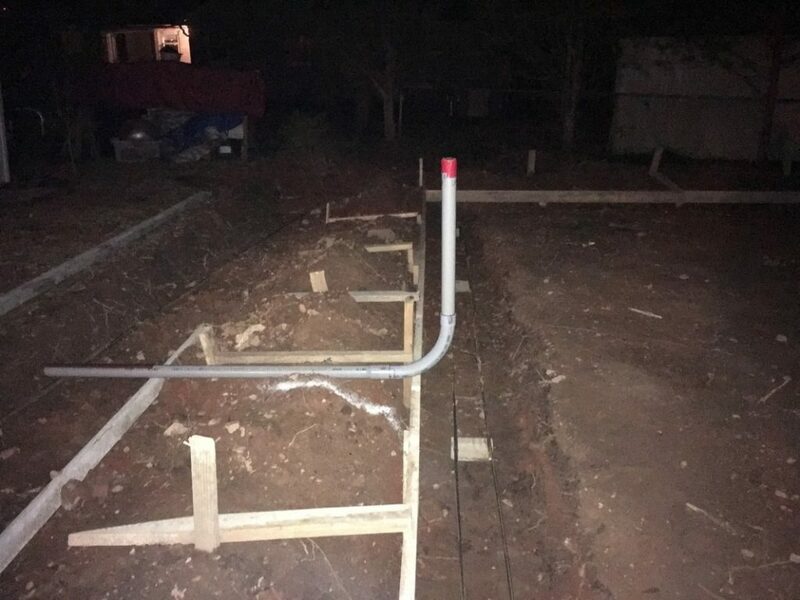 Batter boards also known as stakes and kickers (vertical 2×4’s shown above and below) are used to help stabilize the foundation form around the outside perimeter of the trench. 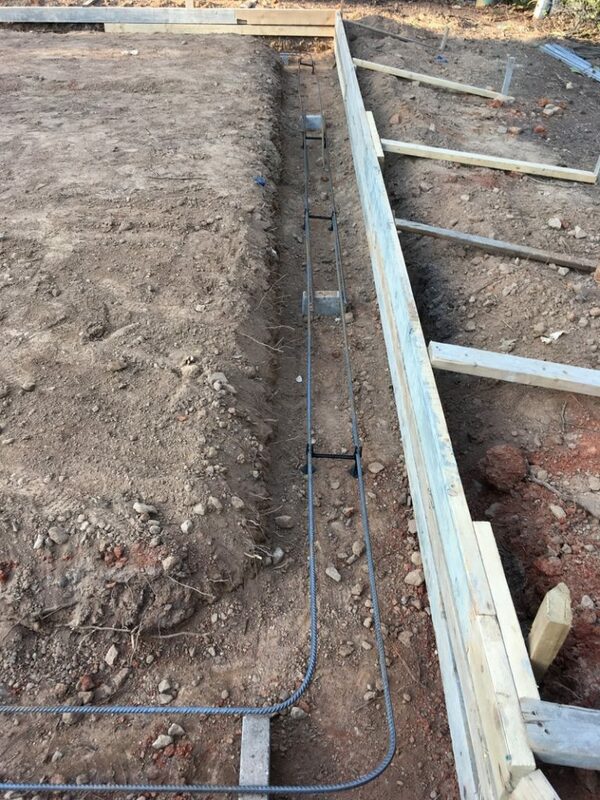 For this project two #2 rebar were cut and bent to form, reinforcing the perimeter trench footing. 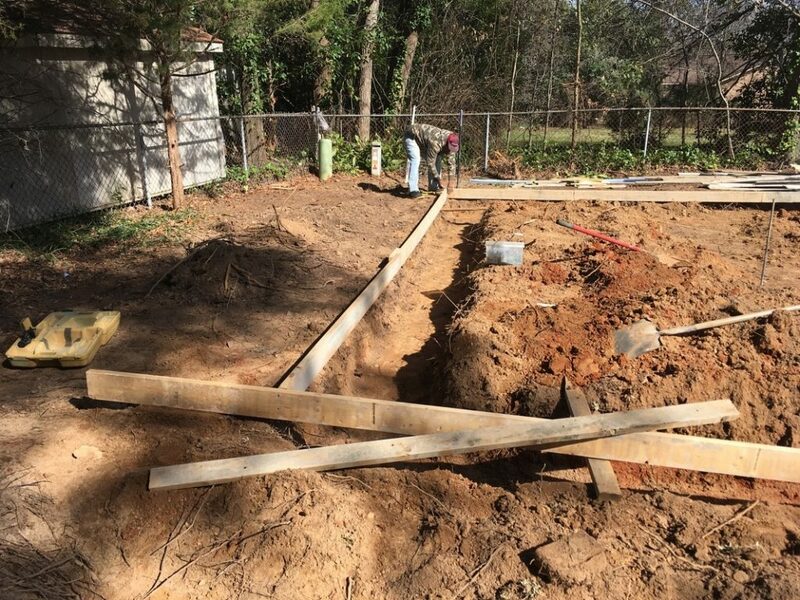 The forming for the apron and walkway to the house began while the rebar for the footing and the cage to support it was built out. 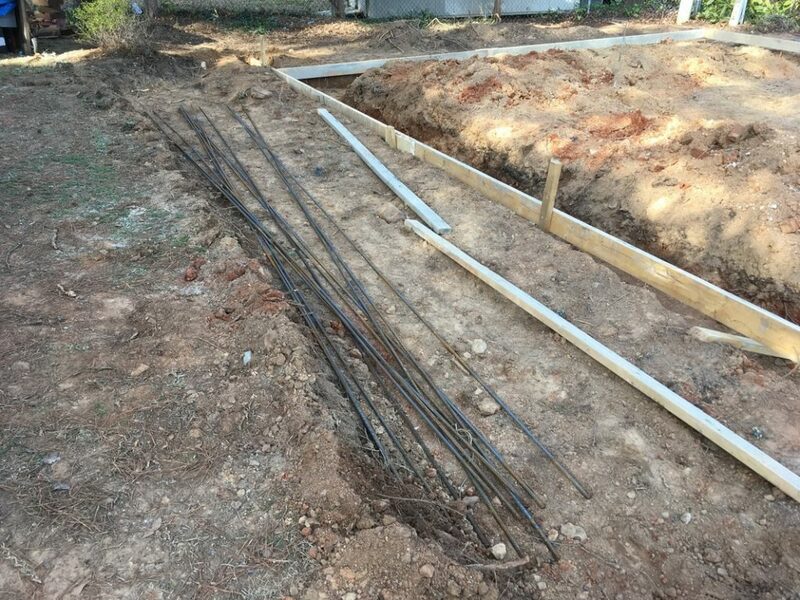 The simple footer was finished with the caging and rebar set. Reinforcing bar is a critical piece in the foundation plan and should be designed by a professional. 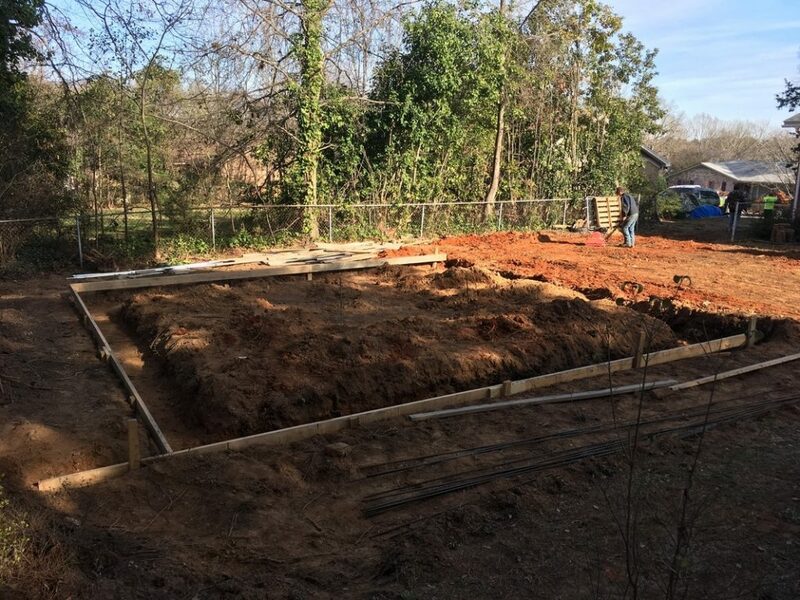 Again, make sure to always investigate with the local building code for the depth of the footing along with any other foundation requirements. 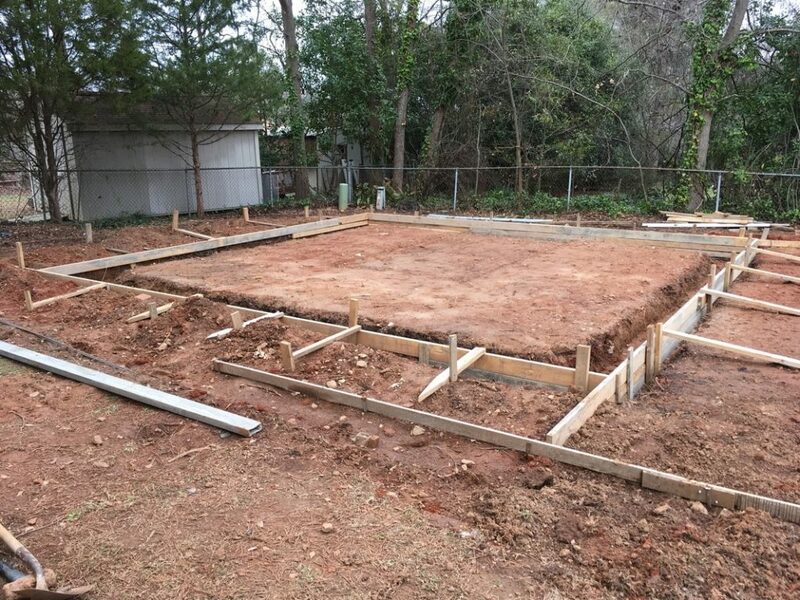 Some areas will require you to build a footing completely out of lumber and not allow an “earth formed” foundation as shown. PVC Piping was installed for the conduit to run through so it would be close to the sidewall. 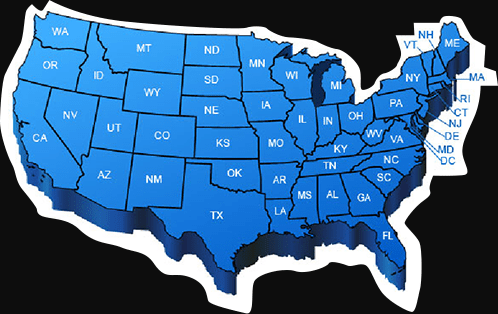 Plumbing and electric mistakes can be costly and are easily avoided by hiring an experienced professional rather than trying to do it yourself. 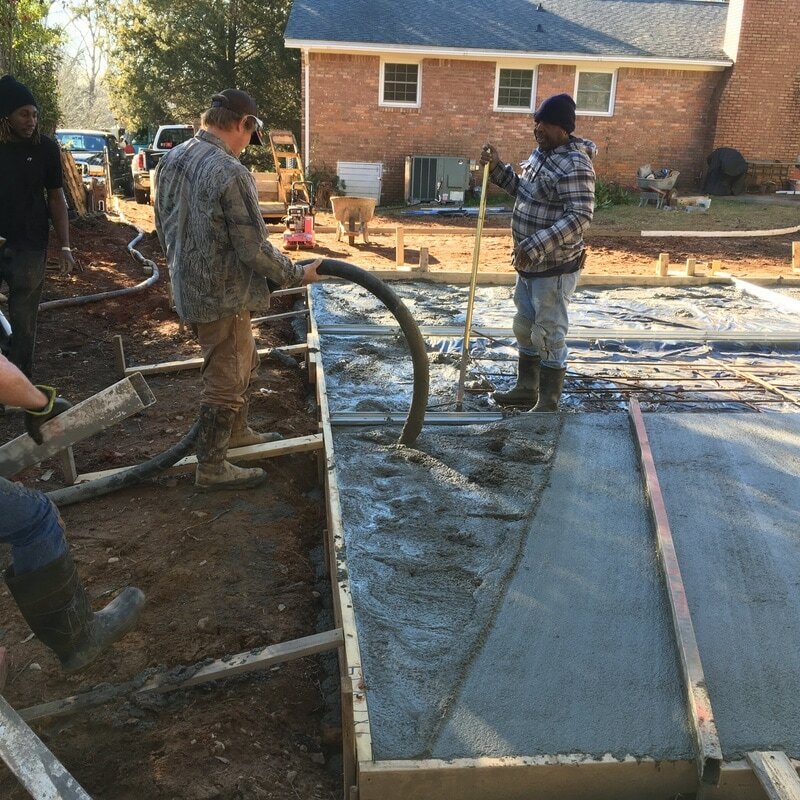 The job was scheduled for a dry and sunny day, the concrete crew and truck showed up early in the morning ready to pour. 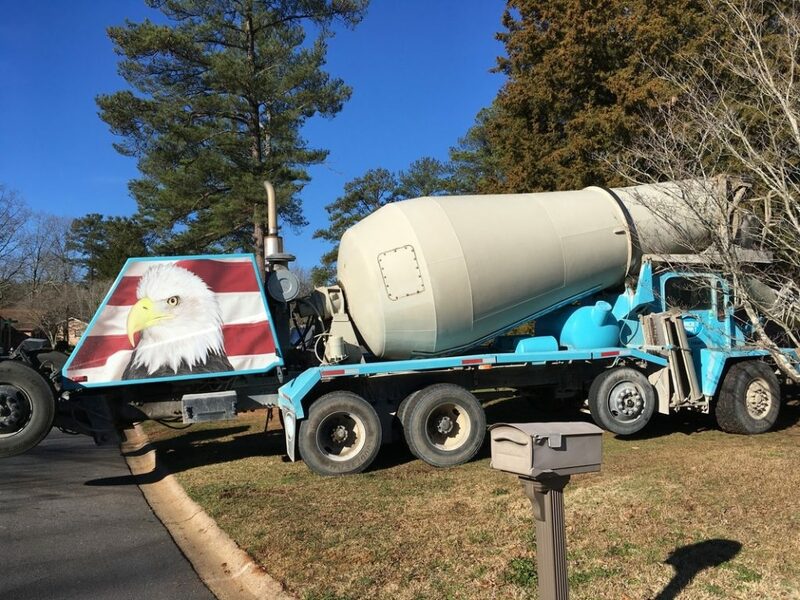 Mixing concrete is a daunting task, a redi-mix truck makes that part easy. A vapor barrier was laid down along with conduit under the concrete floor. Additional rebar was set where the car lift will be installed to reinforce the floor. Expansion joints were used, separating the slab into sections to allow for movement and to prevent frost heave. 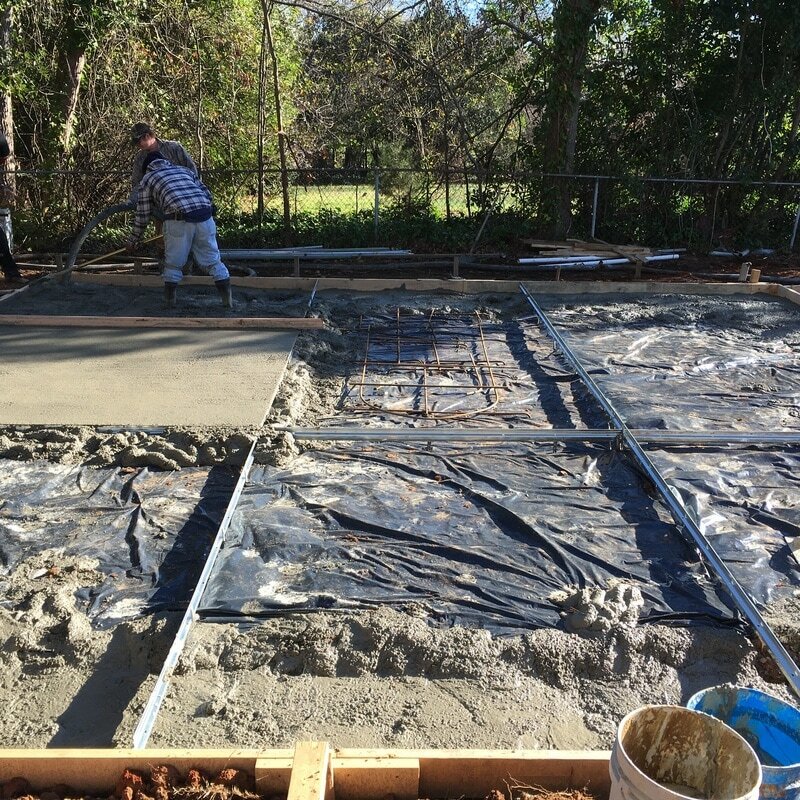 The slab pour and finishing went quickly and smoothly and a few days later the concrete workers came back to do the apron and walkway. After about a 30 day cure the concrete was ready to start erecting the building. 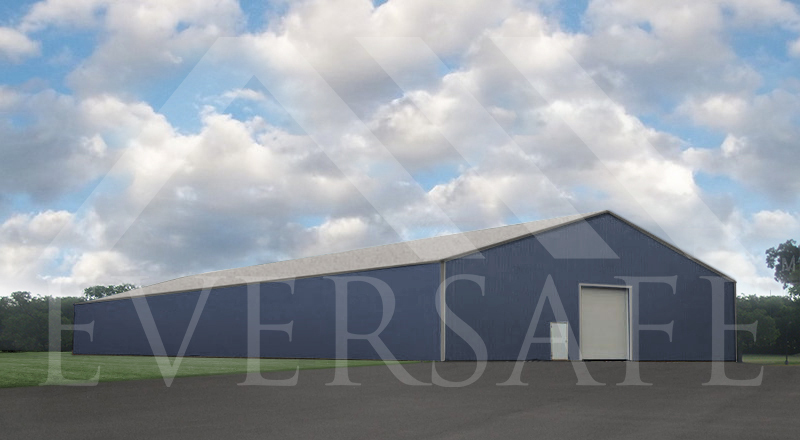 When putting in a garage concrete slab for a steel building, you have a few options to consider other than size. 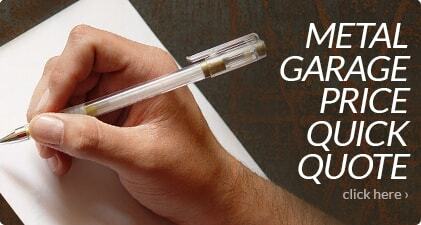 For starters, how elevated do you want the slab to be? This is an important question because you have to consider the fact that if you’re in an area where the ground is under sea-level or prone to flooding, you could be at risk of damage to whatever is being kept in the unit. 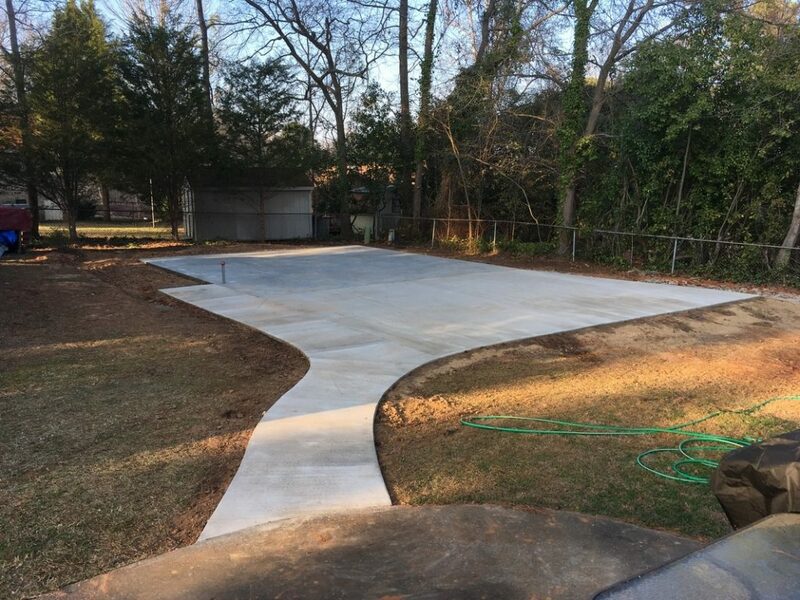 By elevating the slab, surrounding it with gravel and other materials that absorb water and install drainage, you can drastically reduce your chances of having problems with flooding. 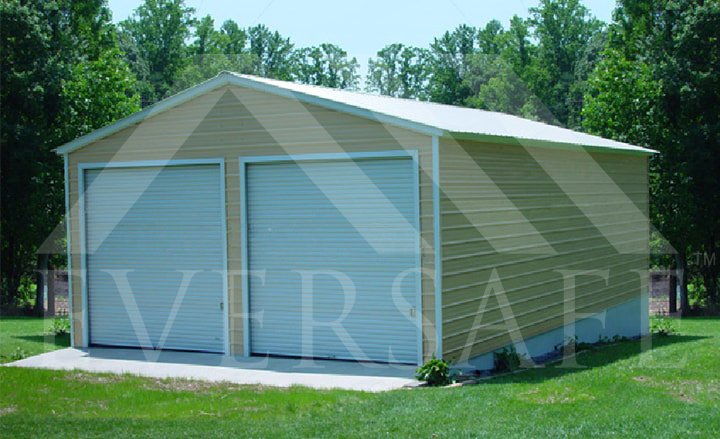 You can also reinforce the slab with steel rods to offer more support for large vehicles like RV’s. 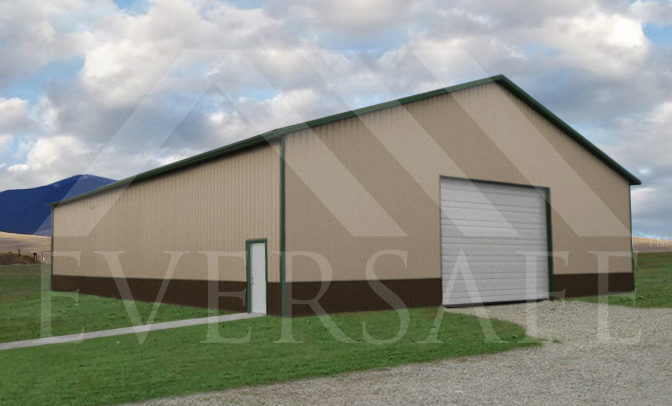 There are several options to consider like 3-car or 2-car garages, the height of the structure and the door size, if you want to put a small office in it as well or something else. 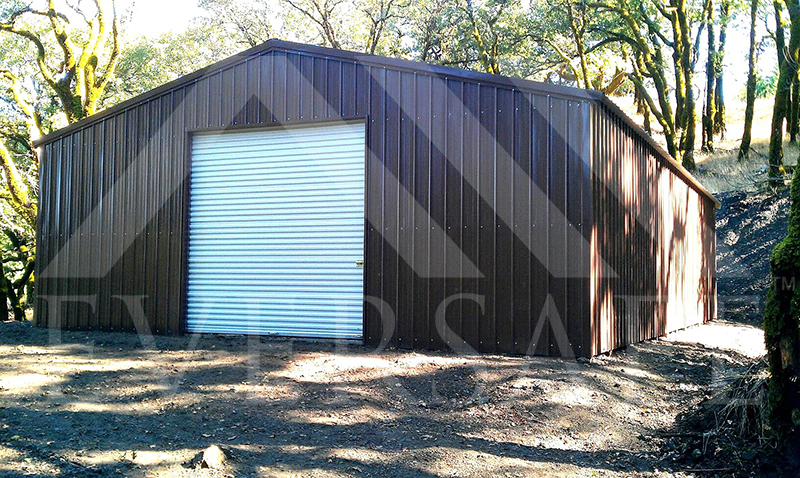 These metal workshop garage options are great because they are affordable and can be installed quickly. 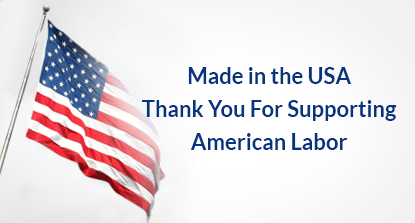 Another great feature about them is that they also work great for commercial and residential properties. 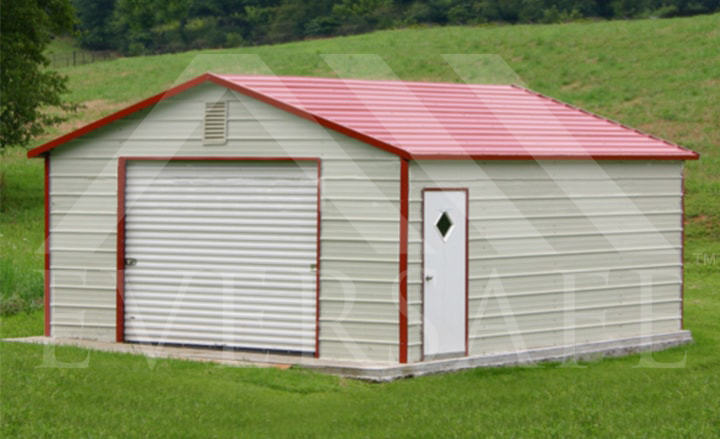 Whether you are looking to add a small unit to your home to act as a workshop or you need to store vehicles and tools for your business, these are the best units to use. 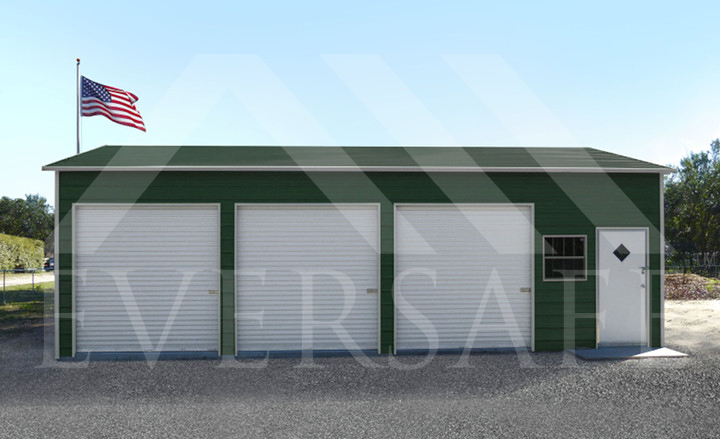 Eversafe Metal Buildings can help you design the garage concrete slab you need and offer a great selection of discount steel buildings. 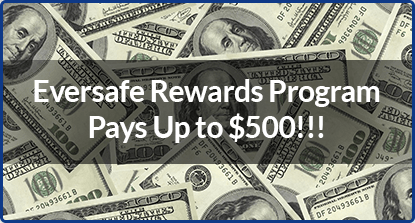 Contact us today for more information and to get a free quote.